Recently I had a bit of an accident when I stupidly entered the wrong letter letter into a command and ended up removing myself from all the default groups on my profile in Crunchbang Linux. No problem, I thought, I'll just use the same groups that I added my username to when I created my Gentoo system. Problem: Gentoo and Crunchbang (Debian based) use different groups. This was a more annoying problem than I expected. This resulted in a lot of wasted time so I thought I would share the experience so that it could be easily fixed without wasting the amount of time I did in looking for a solution. Please note that the above command may appear to be on different lines, but it should be written all on one line with a space after "-G" and after "powerdev", all the groups are separated with commas. Once you have done this then your new user is ready. Don't forget to add the new user to the sudoers file, if your not sure about this then take a look at this post for some extra help. If your like me and you end up removing the user from the groups then simply add your current username to the above command. Simply Mepis 11: simple enough? Mepis was one of the distros that I had not tried until very recently. 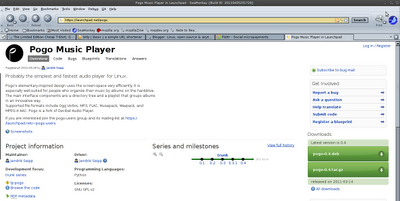 It was often described as the distro for newbies before Ubuntu was around. 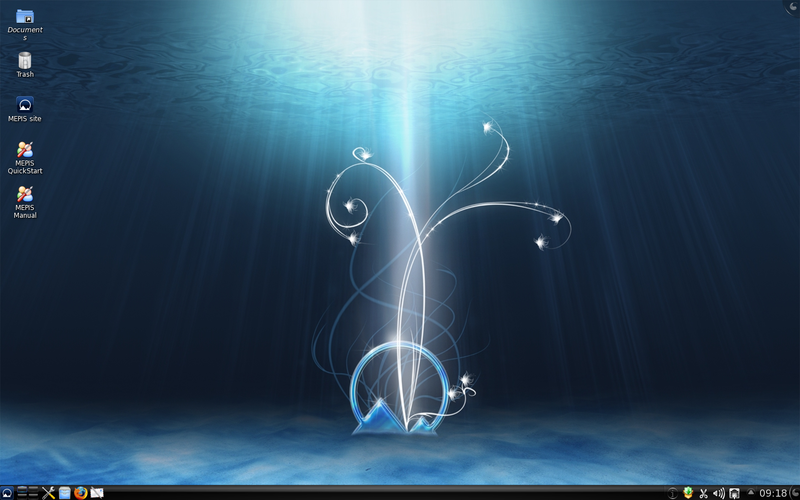 With Ubuntu's move to Unity and a lot of other distros embracing Gnome 3, more and more users are looking to other, more traditional desktop environments, such as XFCE and KDE. Mepis uses KDE as it's choice of desktop environment and is intended to work 'out of the box', which is not the norm for a KDE distro. 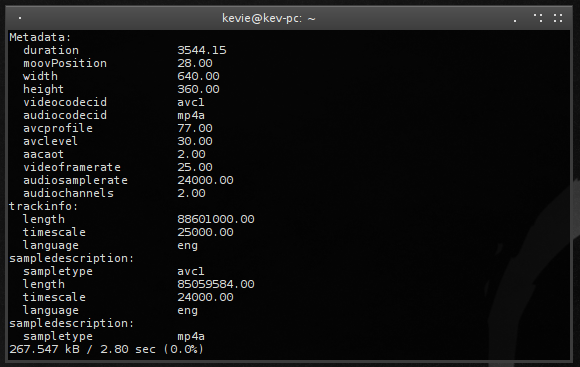 Upon loading my graphics card, Nvidia GeForce 6200 AGP, worked without any tweaking; an impressive feat by any distros' standards. I was able to get the extra effects working straight away. This was the experience with all of my hardware; inlcuding my microphone and webcam. The black and blue theme of the distro looks nice and modern, very appealing to the newbie switching from Windows for the first time. Some of the stickier points of a Linux distro for a newbie have been addressed, flash and Java come pre-installed, DVDs and MP3 files play without any need for tweaking. There is a good range of software including VLC and Amarok (media players), Libre Office suite, Dolphin, Kopete (instant messaging client), Inkscape and the GIMP. Some exclusions are noticeable, no software has been pre-installed for micro-blogging or torrents. In my opinion these are some essential user tools that most users expect to be present. With such option as Choqok and Ktorrent available it does baffle me as to the exclusion of these applications. This brings me onto another point in need of development: installing software. Mepis is aimed at newbies, but only includes Synaptic as a graphical package manager. This is the one significant thing this distro lacks: an equivalent of the Software Centre that Canonical provides in it's Ubuntu distro. Synaptic is not a tool for a newbie user, whilst I personally use the command line tool aptitude (which I had to download using the command sudo apt-get install aptitude) this is not ideal for the new user. 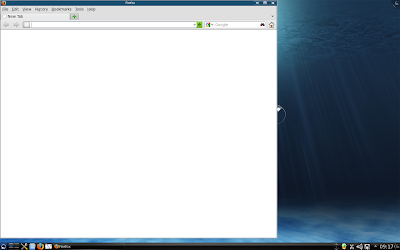 Firefox 4 is the pre-installed browser of choice in Mepis 11. 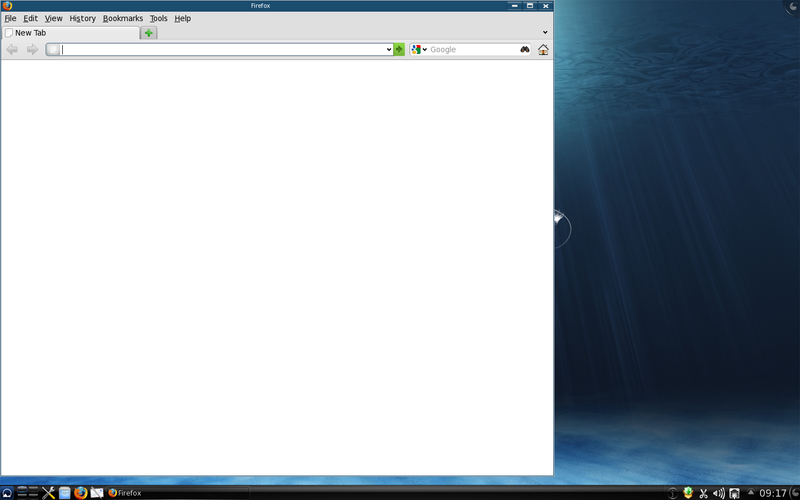 The odd thing about this is that by default the page opens up to a blank screen (shown below). Most users like to see something when they load a browser, even if it's just to show that their internet connection is working. I would like to see the startup page being linked to Mepis or a search engine, but a blank page, in my opinion, isn't the best option. However these issues aside, Mepis is a very solid ditro, with a lot of features that work out of the box, this makes it very difficult to pass up as a good newbie distro. No tinkering to get the basics done, youtube etc will work without any tinkering. This approach may not win the support of the puritan freedom lovers, but this isn't the target audience of Mepis. 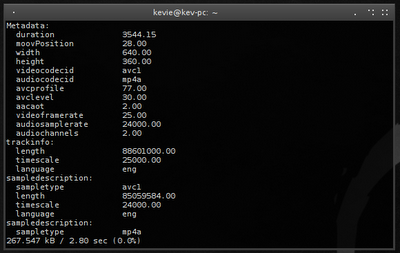 However the lack of a software centre really does hurt the newbie appeal of this distro. 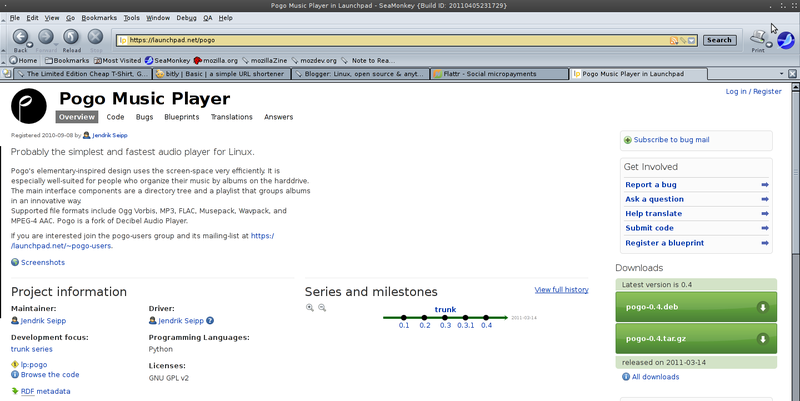 Highly recommended, but make sure there is a Linux user nearby to help setup the system. Having recently volunteered to do a bit of graphics work for a project called Pogo, I thought I should investigate this application a bit more and even give it a trial run. I have to confess, at the time the email came in requesting help with a logo I accepted the challenge without even knowing what the application did. After briefly reading through the email and several brief conversations between the creator Jendrik Seipp and myself, I took a look at the website, which to my disappointment was simply a launchpad page. So the first thing that struck my mind was that this was, primarily, an Ubuntu project. The choices for download are a *.deb file or the source data in a *.tar.gz file. As I have Crunchbang installed on my system anyway I opted for the deb file simply to make life easier. 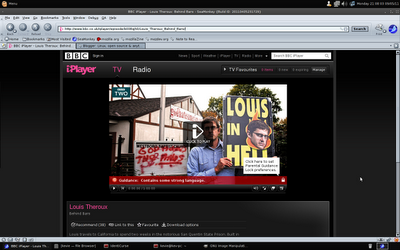 The user interface is very simple; a window split into two screens. The left screen is a tree view of your files, this can be navigated quite easily for any music that is in your home folder. However for files that are on a separate partition, you will need to go all the way back to / and manually find the mount point of the drive (usually /mnt or /media depending on your distro). The partition must be mounted already as there is no way to mount it from Pogo. The right screen is your playlist, to add a music file you can either double click on it in the left screen or drag it into the right screen using the mouse and holding the left button. The responsiveness of Pogo is very good indeed, it is lightning fast and the files play without any delay. Whilst playing, a progress bar appears at the top, which can be dragged to get the position in the file you want, handy for longer podcasts. Also the cover of the album appears in the bottom right of the window. True to Ubuntu style, whenever a new track starts a notification pops up in the top right of your desktop just under the system tray (again this is depending on your desktop environment, but this is the case in XFCE). These, thankfully, can be turned off with a single click in preferences. 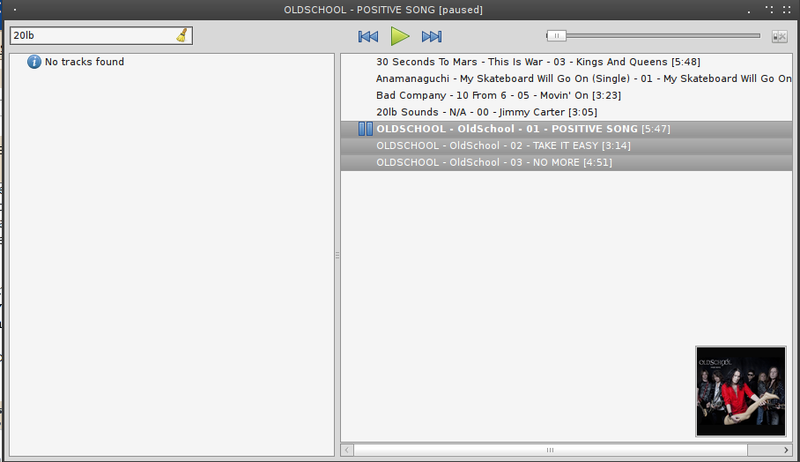 The ability to add all the files from a folder, instead of selecting the files and moving them over to the playlist screen. This isn't aiming to be VLC. 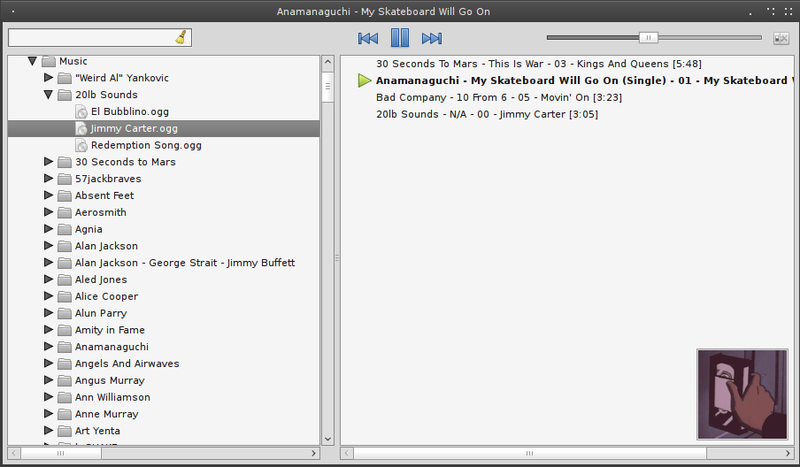 It is a fast and simple music player and, if I'm being honest, it plays files and uses up hardly any resources in the process. The notifications that can't be interacted with are very much in line with the current Ubuntu trend. I feel that this project is best suited to low spec machines and (very early stage) newbie users, those like your older relations who only want to play a few files. Pogo adopts a 'keep it simple' philosophy, the lack of options and buttons make it incredibly easy to use. 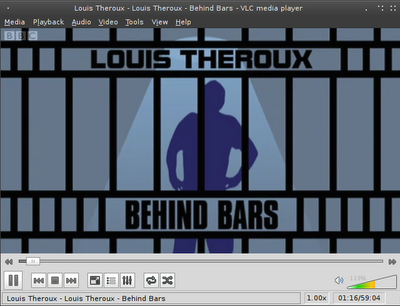 I'll keep an eye on this project, but I won't be uninstalling VLC quite yet. A bit too basic for my needs at the present time. You can Flattr any (or all three if you like) of these pictures by clicking on them, every donation is always appreciated. Supporting open source. All of the above graphics were made exclusively using Inkscape. 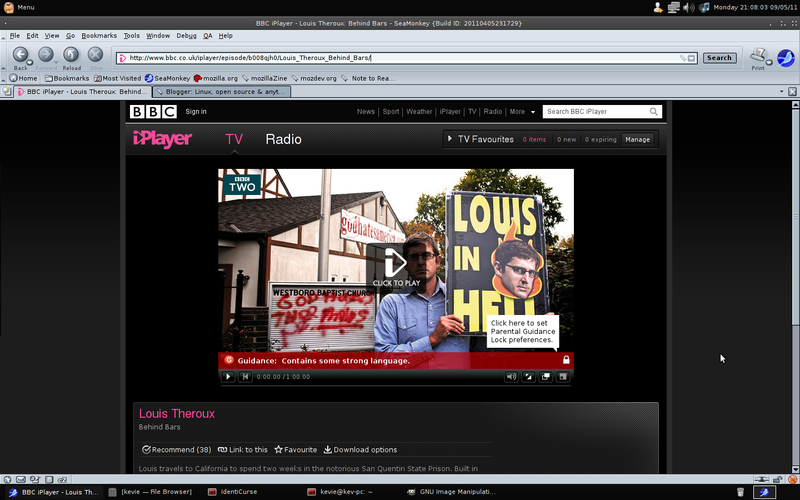 The BBC iplayer offers viewers a chance to catch up on programmes that have recently been shown on the channels. However this is for a strictly limited period and many of the programmes shown will not be released on DVD. A lot of us still don't have DVD recorders, most of us have disconnected the video recorders, although Sky+ does allow us to store programmes, they can only be stored to the local box and not to portable devices or even other TVs in the house. The application is now installed on your machine however it is a command line tool and therefore will not show up on your applications menu. 2. Copy the web address of the programme from the address bar. 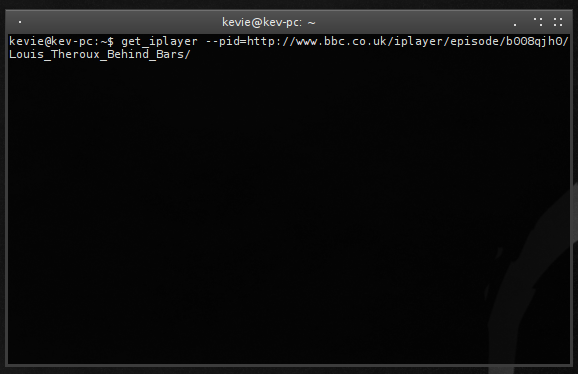 get_iplayer will start to convert the film and it will be saved as an MP4 file. The file is now saved on your computer, the best part is that it is now DRM free, you can watch it on your media player, phone (you may need to perform a bit of converting/editing) or any other PC in the house. If you want to watch it on your home TV through your DVD player then that is also possible (I personally recommend DeVeDe for that task). Enjoy your videos.